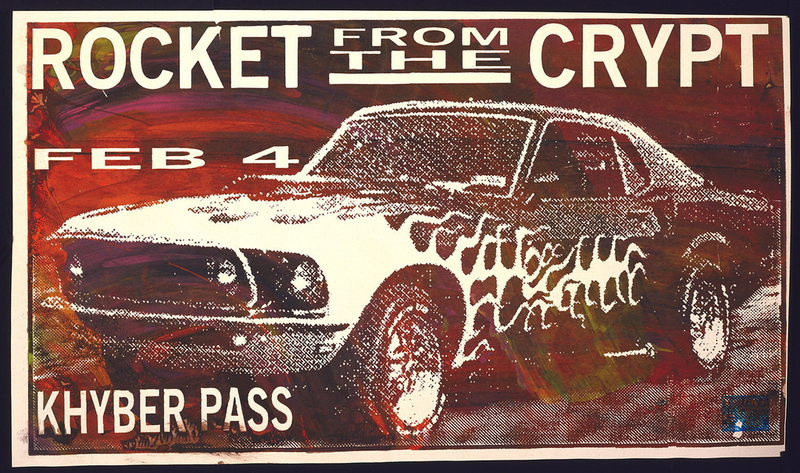 See more objects with the tag travel, music, concert poster, flames, wheels, cars, screenprint. See more objects with the color saddlebrown darkslategrey lightyellow antiquewhite brown or see all the colors for this object. This is a Poster. It was designed by Marcus Durant. It is dated 1993 and we acquired it in 1995. Its medium is screen print support: paper. It is a part of the Drawings, Prints, and Graphic Design department. This object was donated by Marcus Durant and catalogued by TM. It is credited Gift of Marcus Durant. 15 1/8 x 26 1/8 in. Across top of sheet: "ROCKET FROM THE CRYPT"; "FEB 4" below. In lower left corner, "KHYBER PASS".